The U shaped kitchen is the perfect solution for when you’re lacking essential kitchen space. It’s also perfect for bigger kitchen spaces. What we’re trying to say is (depending on shape) there isn’t a bad place for a U shaped fitted kitchen! We’ve seen a big drop in people wanting U shaped kitchens and that’s what this blog is here to change. First thing’s first, we want to explain what a U shaped kitchen is, just to clear up any confusion! A U shaped kitchen consists of three sides of cabinets with one edge and a short side. This short side is usually facing a wall or a window. It tends to home the sink and draining board. U shaped fitted kitchens are ideal for smaller sized kitchen areas, however they can be seen as a more expensive option. This is due to the amount of cabinets and units that need to be used to create the shape. However, it does mean you will have a lot of storage space which is perfect for those with a family. When it comes to designing a U shaped kitchen (which of course will be dealt with by our expert kitchen designers) it’s important to remember to give space to your large installed appliances like cookers, ovens and washing machines. You don’t want to over crowd an area and make it difficult to work in. For larger U shaped kitchens, it’s a nice idea to include a breakfast bar as one of your sides. It then has a dual purpose and your kitchen can still be the hub of your home! 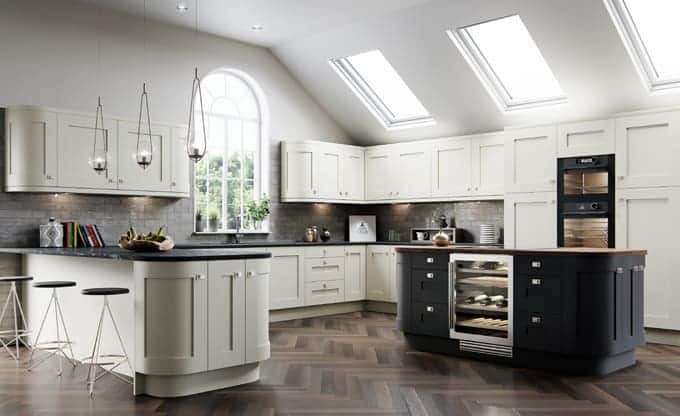 So if you’re interested in a U shaped fitted kitchen, or you would like to see what we could do with your current kitchen, get in contact with one of our team today! Let us organise a free, no obligation home design visit!